Ahhhh, how I love angel food cake. It’s my all time favorite cake in the world. I love it with fruit, I love it plain, I love it with chocolate and I just simply love it. I guess you can tell I kind of have a thing for angel food cake. 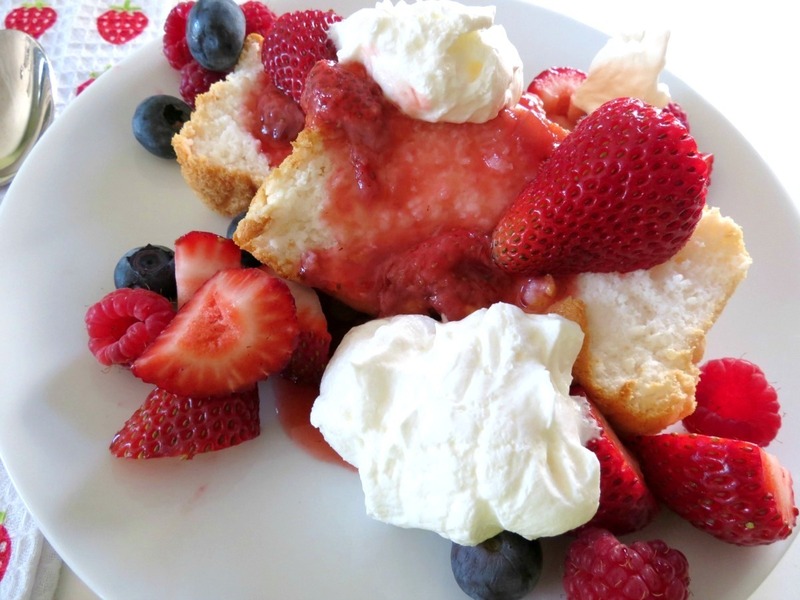 I am sure you guessed it, but today’s recipe is for Angel Food Cake with Strawberry Sauce. Oh boy, oh boy!! I don’t know what it is about that fluffy white cloud they call angel food cake, but I must have it. It is my requested birthday cake every year and darn that Husband of mine, he really does try to make it for me, but he cheats and buys the stuff in the box. That’s ok, I like that too!! One year, he didn’t realize I had an angel food cake pan, so when he bought his box of mix, he also picked up a cake pan from the store. You know how they come in two pieces? Well, he didn’t realize it, but he grabbed about 10 of the center tube pieces and one base. He made his cake, though I am not sure how he did it? But one day, when I was digging through my cupboards I found all of the center rings. I asked him, where the heck did these come from? He looked, laughed and said, huh, I must have grabbed all of them when I was at the store. The cashier didn’t even notice. lol, Now I have a bunch of angel food cake tubes. 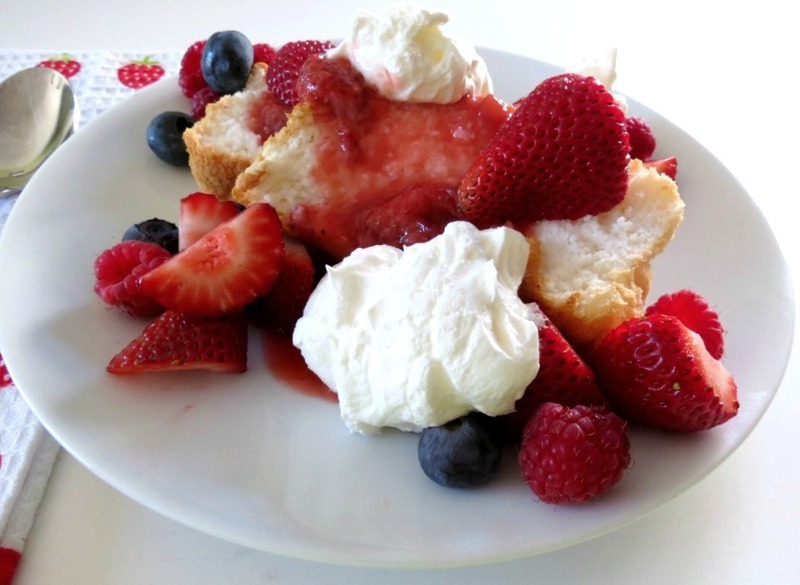 My angel food cake is super easy to make and you don’t even need a traditional angel food cake pan to make it. I made it in a loaf pan. I find it easier for the cooling process, since I hate trying to find a bottle to hold my angel food cake pan upside down. The cake turns out light, fluffy, sweet and just perfect every time! But I needed a little more when serving it, so I made a super duper easy strawberry sauce to go with my cake. 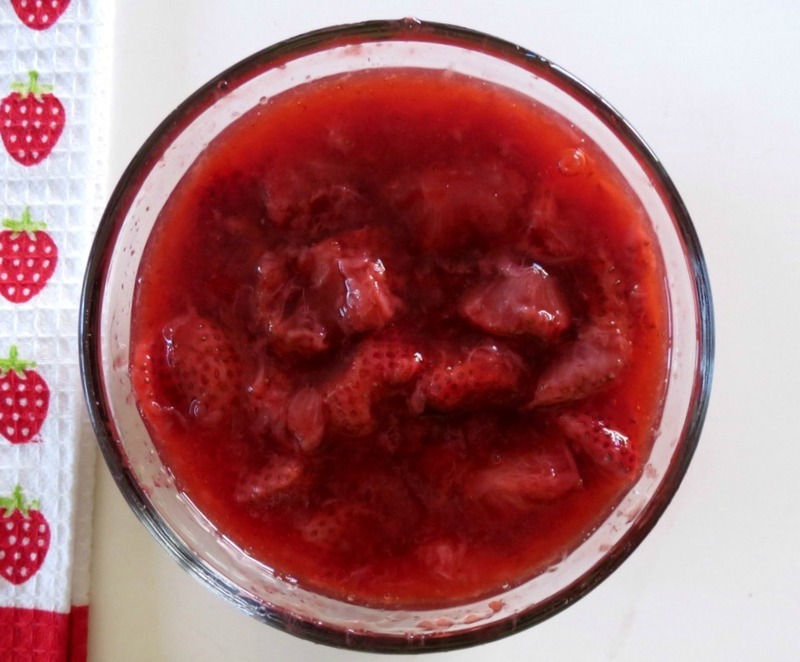 The sauce is made with fresh strawberries, stevia, water and cornstarch. Just heat it all on the stove top for about 10 minutes and it turns into a nice sweet, thick sauce. I use the leftover sauce for topping on toast or mixing in my yogurt. You already know I am a berry freak, so I had to add more berries to my dessert. I may have gone a little overboard on the fruit, but I can’t help it, I just love my fruit! 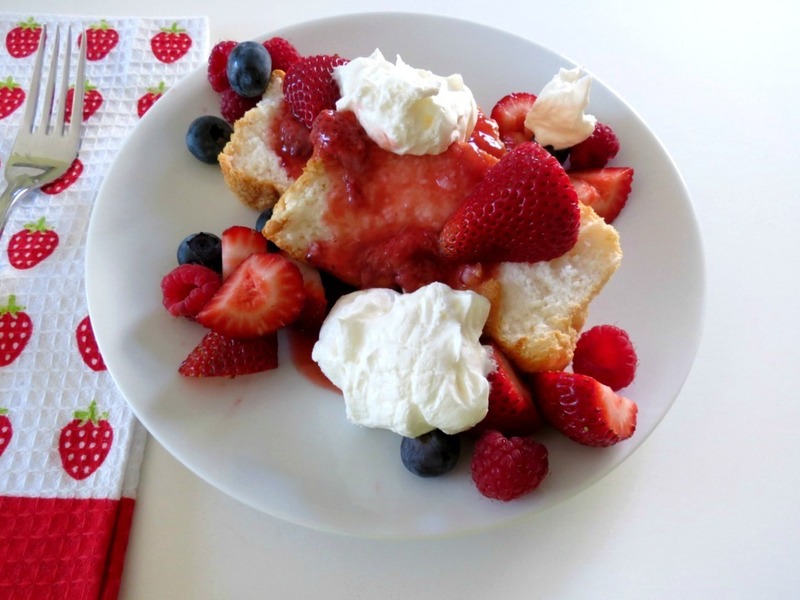 A light, fluffy, low calorie cake, topped with homemade strawberry sauce and fresh fruit. Mix half of your sugar in a small bowl with the cake flour and salt; set aside. Carefully spoon mixture into the ungreased loaf and and bake for 35 minutes. 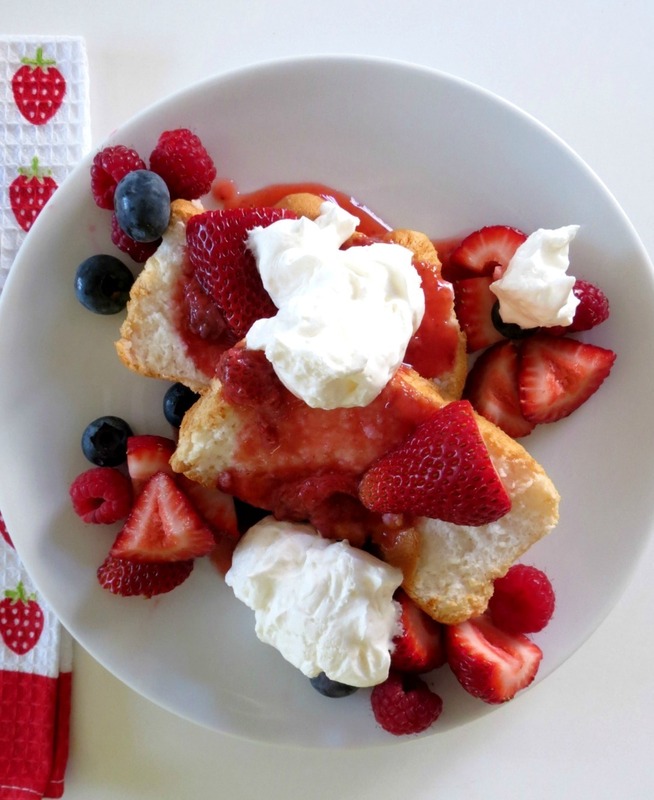 To make the strawberry sauce: In a large skillet add strawberries, water, cornstarch and stevia. Over medium heat, keep stirring the strawberries, until it becomes thick. Set aside until it slightly cools. Left overs can be stored in an air tight container in the refrigerator. 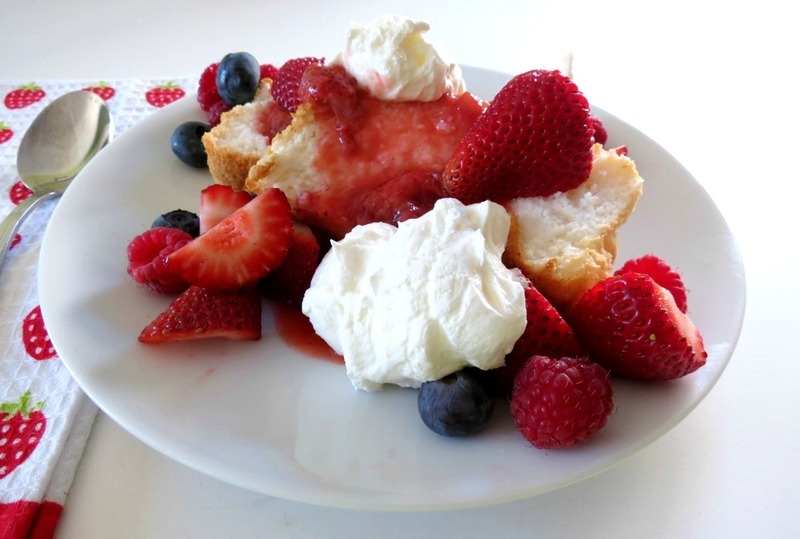 Cut angel food cake into six even slices and top with strawberry sauce and a dollop of whip cream. Add additional berries if desired. Oh the beauty of Angel Food Cake! This dessert would be wonderful for a special holiday or even, do I dare say it? Valentine’s Day, which is coming up next month. Where does the time go? It’s crazy how fast it goes! All I know is I am looking so forward to summer. I can’t take this cold anymore!! Have a wonderful day! Keep warm and make a healthy, good for you dessert!! Mmmmm I wish I could be teleported into your house to taste this right now! Can someone please invent taste-o-vision!! I wish you could be too!! If you ever come to N. California, let me know, so we can hook up! Looks like the prettiest, most delicious yet decently healthy dessert Jennifer, I love it!! Ahhhhh, thank you so much Chris! Gosh this looks unbelievable! That strawberry sauce is magical! Thank you Jocelyn! I kind of have a thing for strawberries! They are just so good!! Thank you Natasha! Thank you for hosting a link party!